DI Mobile™ is Dimensional Insight’s iPad®-based information delivery platform that enhances the effectiveness and productivity of an organization’s mobile workforce. With DI Mobile, performance data is easily accessible, synchronized with a touch of the screen, and linked to relevant content such as presentations, documents, images, and news. DI Mobile™ delivers Business Intelligence to the mobile workforce, enabling better business decisions. Get to know DI Mobile™ by downloading a demonstration version from Apple’s App Store. DI Mobile delivers guided reports, analytics, and other relevant documents, presentations, and images to mobile users. We welcome the opportunity to get your reaction to DI Mobile, demonstrate DI Mobile in action, and discuss how you can use DI Mobile to get key information to your mobile users in a timely fashion. To download the free DI Mobile™ demonstration, simply visit the App Store on your iPad. Through App Store Search, select Business applications, and then search on “DI Mobile.” Download the application, and you’re on your way. Link Performance Data and Diverse Content: Presentations, Files, Photos, News, etc. DI Mobile™ gives access, via the iPad tablet, to business performance information and content that is accurate, secure, relevant, and timely. Users have up-to-date data at their fingertips, whether they are online or disconnected from their enterprise information repositories. DI Mobile is built from the ground up on The Diver Solution™, DI’s award-winning Business Intelligence platform. 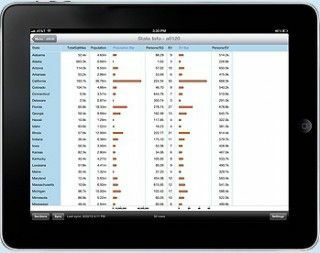 By combining self-service reporting, ad hoc analytics, and data integration capabilities with the familiarity and flexibility of the iPad, DI Mobile enables mobile users to rapidly gain insight, spot trends and respond to market demands. With an easy-to-use, touch-based experience users expect from the iPad, DI Mobile users are immediately productive. DI Mobile is the tool of choice for executives, managers, field sales and services teams, and others.